Sundays are always long boring days for me. I don't know why, but it has always been that way. My house is clean enough and the laundry is caught up. My husband is working on a big project so there is no hope of going anywhere or doing anything fun. I had to occupy myself. I grabbed some iced tea and went outside to start a campfire. It was a beautiful day to just sit and relax. As I was starting the fire, I noticed I was down to my last two fire starters. I decided I could multi task. I could sit by the fire and make more fire starters. Quite a while ago I wrote about giving away egg cartons. http://www.thecabincountess.com/2013/02/egg-cartons-and-berry-baskets-to-give.html It has gotten to the point where I can't find anyone who wants them. You would think with the popularity of raising chickens, I would easily be able to give away cardboard egg cartons. Since I have a bunch, I didn't feel bad about re-purposing a couple. 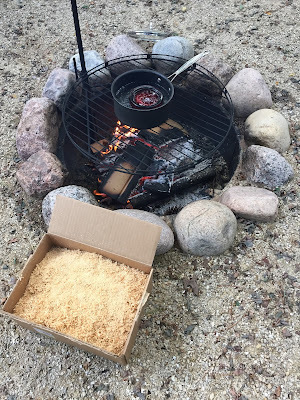 I make these fire starters with old candle wax, sawdust and egg cartons. Since I discovered essential oil diffusers, I don't burn that many candles anymore. I have kept a few of the jar candles that have the wick burned up but still have wax in the jar. It sounds like I'm a hoarder, but I don't think I am. I just keep things I know I can re-purpose. When making this type fire starter, the first thing you do is melt some wax. Whether it is a block of paraffin or used candle wax, it really doesn't matter. I tried a new approach today to melt the wax. 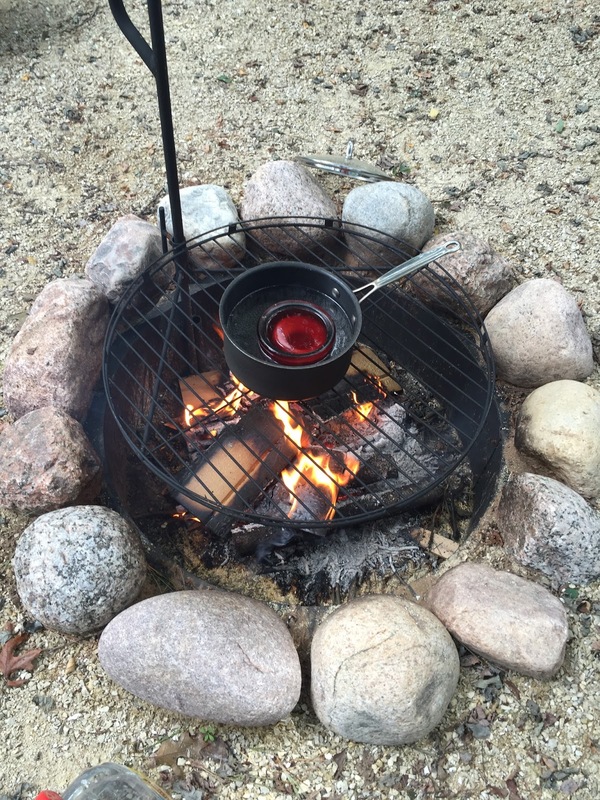 I filled an old kettle we had in our Goodwill donation box with water and placed it on the campfire grate. In the water, I placed a used jar candle. My husband thought melting the wax outdoors was also a lot safer. It worked great. If I spilled, it was no big deal. I sat and relaxed while the hot water melted the wax. Then I went to my husbands workshop and gathered some sawdust off the floor. While working on his project, he made a pile of sawdust that hadn't been swept up yet. I filled a box with sawdust even though my project will only take a small amount. This box of sawdust will last for a very long time. I gathered an old metal coffee can and cut the tops off the egg cartons. I just threw the tops in the fire. At this point I filled the coffee can about half full with saw dust. 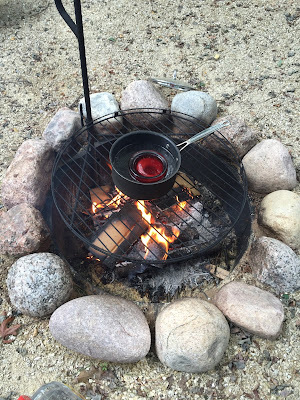 I took the saucepan off the fire and let it cool off a little bit. The wax will stay melted for a long time. I found a stirring stick and poured the melted wax into the sawdust. I mixed it completely so all the sawdust was moistened with wax. Then I took an old cookie scoop and placed a scoop of mixture into the egg cartons and pressed them down firmly. That is all there is to it. I intended to fill three egg cartons, but I miscalculated and half a coffee can only makes two dozen starters. Using two egg cartons won't put a dent in my stash of cartons, so I will still have to find a home for them. To use these fire starters, just cut them apart after the wax has hardened. When you want to start a campfire, just place two starters in the fire pit with some kindling. Light the cardboard carton and the wax will begin to burn. There is no need for lighter fluid or a lot of paper. I just store the starters in a covered container and grab what we need whenever we have a campfire.